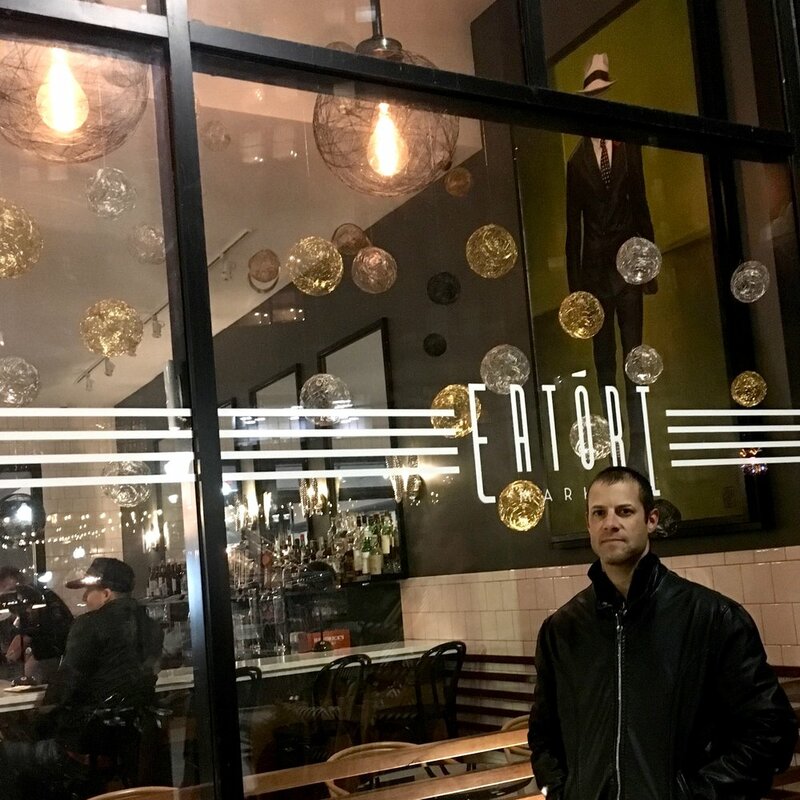 Mike O’Reilly stands in front of his 2018 Detroit Holiday Window Walk display, at Eatori Market. I was determined to win the 2018 Detroit Holiday Window Walk contest, and I worked for about two solid weeks constructing the components of my entry. After the first week, I trashed my first idea and started over. I also incorporated a powder coating treatment in the creation of the large black balls, which drastically improves the durability and overall look. Although I consider the entire process and final installation a great success, my efforts could muster only second place in the contest, with the top podium spot going to last year’s winner, Third Man Records. Congratulations to Campo Collective for their awesome winning entry! The Holiday Window Walk is a window design competition held by Lawrence Tech’s Detroit Center for Design and Technology, in collaboration with Prologue Detroit and ten participating downtown businesses. Artists and design teams submitted applications by early October, and the winning applicants were matched with a store, restaurant or salon. Window designs were completed by mid November, and the winners were announced December fourth. Votes were tabulated based on the opinions several individual judges in combination with the total number of social media posts for each window with the hashtag #holidaywindowwalk18. Up for grabs in this year’s contest was a first place prize of $500, and a second place prize of $250. The 2018 Holiday Window Walk competition was a great experience, and I’m thrilled to take second place. My work will be on display through January. Next year I’m going for the gold!